There are two joys inherent in early science fiction. The first is in seeing how we used to imagine the universe. The second is in seeing how far we’ve come. Those are two of the wonderful things about this reading of Griffith’s 19th century science fiction adventure. The third is the measured authority with which Dudley Sutton tells the stories. It manages to do that all but impossible thing for period narrations; call attention to the differences in language and style without parodying them. That calm, measured approach works all the better here because of precisely how lurid Griffith’s text can be. 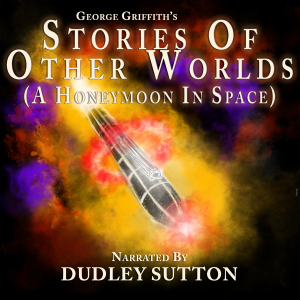 The story is simple; an upper class newly married couple (and their magnificently grumpy Yorkshire engineer) take a honeymoon on their newly constructed spacecraft. They travel the solar system, mimicking the ‘Grand tour’ that aristocrats used to take around Europe. Along the way they find wonders everywhere in the solar system and, on occasion, kill them. This is ‘The British the British the British are best’ writ large and given space suits. In the hands of a modern author it’d be repulsive and hopelessly naïve. With a gap of a century between Griffith and us it becomes oddly sweet. The leads are, for all their occasional bloodthirstiness genuinely awed by the solar system around them. They’re also very fond of one another and that affection, along with the endless competency of their engineer, is one of the driving forces of the stories. None of that stuff would play for a second in modern SF but here it’s fascinating. This is a journey as much around the mind and time of Griffith as it is around the wonderfully busy solar system he imagined. All conveyed with expert tact and precision by Sutton.